One of the rites of passage when you’re a teenager is to try and sneak into the cinema to see a film that has a rating older than your actual age. Â Once you can legally see a 15 certificate film you set your sights on getting into an 18 certificate, which generally means going to see a horror film. Â In the eighties, chances are said horror film would have been one from the Nightmare on Elm Street series. Created by Wes Craven, the Nightmare on Elm Street films are about the hideously faced, stripey sweatered villain that is Freddy Krueger, portrayed so well by Robert Englund. Â Topped off with a fedora hat and the famous long bladed glove, even if you’ve never seen one of the films you surely must know who Freddy Krueger is. The first film in the series tells the story of how the teenagers of Elm Street start to suffer nightmares where a shadowy figure stalks them. Â When they awake they find these bad dreams may have been more than just nightmares, as they find cuts in their clothing and even on their bodies. One of the first to be affected is a young woman called Tina, who is so petrified about going to sleep she convinces her friend Nancy and Nancy’s boyfriend Glen (Johnny Depp’s first movie role!) to sleep over to calm her down. Â Tina’s boyfriend Rod also comes along, and as the evening progresses he convinces Tina to go to bed with him, something which he regrets later when he awakes to find her being gored to death and pulled across the ceiling of the bedroom. Not surprisingly the police arrest Rod for the murder of Tina, but when Nancy and Glen start to experience similar bad dreams they are not so sure he is the culprit, and when Rod dies whilst in a police cell it convinces them still further. Â Nancy is now also petrified of going to sleep, so her mother takes her to a sleep therapy centre, but when she awakes from a nightmare clutching the hat of the shadowy figure, her mother explains what is going on. Many years ago, Fred Krueger was arrested for serially killing a great many children. Â When he was released from jail on a technicality the townsfolk took their revenge, chasing him into a boiler room and burning him to death. Â Now it seems he has come back from the dead by invading the dreams of teenagers to up his murder count. Nancy and Glen hatch a plan to stop Freddy, but before they can carry it out the sleep deprived Glen falls asleep and is killed by Freddy, so it is left for Nancy to face Freddy by herself! A Nightmare on Elm Street has to be one of the bloodiest films ever made, with the various exaggerated deaths of the characters requiring buckets of red water and fake blood. Â It was also more of a true horror film than later films in the series which became increasingly more comedic in the deaths of the characters, although it still was a bit tongue in cheek throughout. Freddy has since featured in no less than eight films, most recently in 2003 where he went up against fellow horror character Jason Voorhees from the Friday the 13th films. 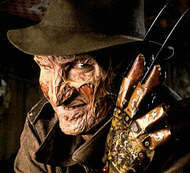 Â He is set to return to the big screen (sadly no longer portrayed by Englund) in 2010. Â There was also the Freddy’s Nightmares TV series, which was a horror anthology series, similar to The Twilight Zone or The Outer Limits, but obviously with a horror theme rather than a more science fiction/fantasy setting, and a bit of a let down since Freddy didn’t actually appear in the stories, he just introduced them. This entry is filed under Films - Teens	and was posted on July 31st, 2009. You can follow any responses to this entry through the RSS 2.0 feed. You can leave a response, or trackback from your own site. There’s one of these films where someone’s veins are ripped out of their arms and used to control them like a marionette…I still have nightmares about that. I think that was the third one, Dream Warriors, which was also the first one I ever saw. It was set in a hospital for the most part as I recall. The Evil Dead films (particularly 2 and 3) are brilliant! no 3 is one of the funniest films I have ever seen, particularly the Brucie Mini Me’s trying to bump him off. His autobiog is well worth a peek if you ever have time -‘If Chins could Talk’..